Mike Pompeo: A Soldier, Spy Chief And Tea Party Republican Becomes Secretary Of State : Parallels He's been a tank commander, a successful businessman, a congressman and head of the CIA. He's cultivated a tough-guy persona with hawkish views on foreign policy. He's set to be the top U.S. diplomat. Mike Pompeo has been a leading critic of the nuclear deal with Iran and has said the U.S. would not soften its stance on North Korea ahead of planned talks between North Korean leader Kim Jong Un and President Trump. "Pompeo is very much a hard-liner on issues of national security, broadly," said Ian Bremmer, head of the Eurasia Group, which analyzes global politics. "He's smart, but he's also quite bombastic, and that plays well with Trump. But that doesn't necessarily support a balanced national security policy." Pompeo recently declared that the U.S. would not soften its stance on North Korea ahead of planned talks between North Korean leader Kim Jong Un and Trump. "Make no mistake about it," Pompeo said on Fox News Sunday. "While these negotiations are going on, there will be no concessions made." Pompeo has previously suggested he favors regime change in North Korea, though, he said in December, "I've learned the art of nuance in my 10 months" at the CIA. "So suffice it to say, I hope that diplomatic and economic pressure will help resolve this in a way that doesn't require a military outcome that I know nobody is excited about." Pompeo has also been a leading critic of the nuclear deal with Iran. He took the unusual step of sending a warning letter to Qasem Soleimani, the head of Iran's Al-Quds force, which operates in Iraq and elsewhere in the Middle East. "I sent a note to Qasem Soleimani because he indicated that forces under his control might threaten the U.S.," Pompeo said during a conference last year at the Ronald Reagan Presidential Library outside Los Angeles. "He refused to open the letter. It didn't break my heart." "With Mike, we've had a very good chemistry from the beginning," Trump told reporters Tuesday, before leaving for California. Trump said Gina Haspel, the deputy director at the CIA, would be replacing Pompeo. One of Pompeo's strengths is his strong personal bond with the president. Pompeo has described the intelligence briefing he provides most mornings at the White House in positive terms. "We have a half-hour, 40 minutes every day. He asks lots of hard questions as any good intelligence consumer would. He's very engaged." Leon Panetta, who served as a CIA director under President Barack Obama, says he and Pompeo speak regularly about the job they've shared. "God bless Mike Pompeo for having the ability to sit down with the president and have the president listen. I was a little worried about that," said Panetta, who appeared alongside Pompeo at the event held at the Reagan library. "But if Mike is doing that, and the president is engaged, that is extremely important to the president being able to do the job." However, The Washington Post recently challenged this scenario, reporting that the face-to-face presidential briefings tended to play down or avoid matters relating to Russia, which might upset Trump. "Russia-related intelligence that might draw Trump's ire is in some cases included only in the written assessment and not raised orally, said a former senior intelligence official familiar with the matter," the newspaper reported. Pompeo's supporters say he'll be a much better fit as secretary of state than was Rex Tillerson, who often seemed out of sync with the president. Pompeo is likely to have far more credibility as the president's surrogate when he speaks to foreign leaders. 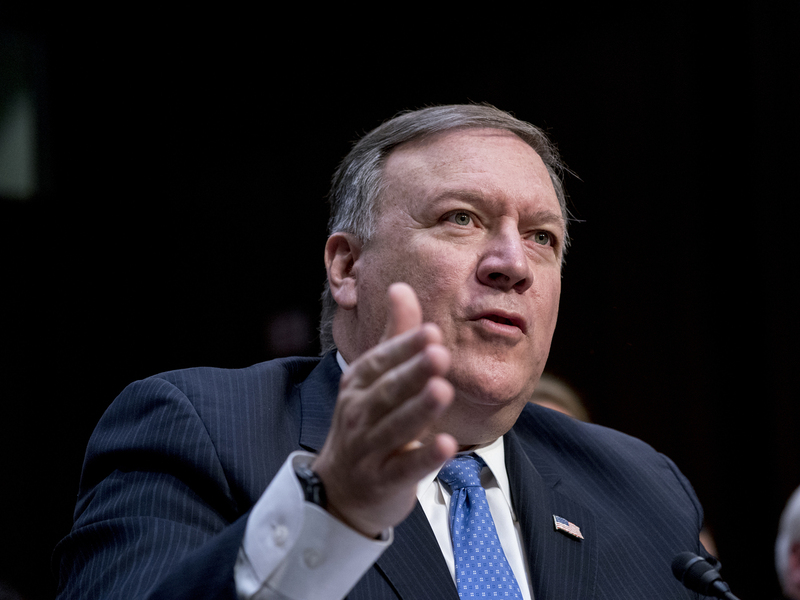 "To my mind, this absolutely represents a job upgrade for Mike Pompeo," said Danielle Pletka of the conservative American Enterprise Institute. "Dealing with the North Korea nuclear challenge, dealing with the Iranian regional challenge, dealing with the China challenge, the Russia challenge, all of those things are an opportunity for Mike Pompeo." After winning election to Congress in 2010, Pompeo has risen rapidly as an aggressive partisan. Before he joined the Trump administration, he was perhaps best known as an outspoken critic of Hillary Clinton and the way she handled the attack on the U.S. diplomatic compound in Benghazi, Libya, in 2012, when she was secretary of state. The U.S. ambassador and three security personnel were killed in the attack. On most issues, it's hard to find any daylight between Trump and Pompeo.